A woman who carried out ‘unprovoked attacks on two young girls’ was jailed for five months last Wednesday at Craigavon Magistrates Court. Shantell Lewis (18), whose address at the time of the offences was Victoria Place, Lurgan, was given the five months in custody for assault occasioning actual bodily harm on November 29, 2013. A concurrent four month term was imposed for assaulting a female on the same date and she received concurrent three month sentences for disorderly behaviour and resisting police. 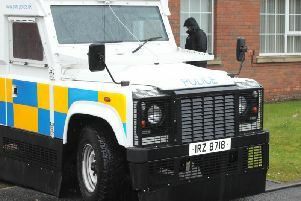 The court heard that it was reported to police that a young girl had been assaulted in the Peoples Park, Portadown. The injured party was walking through the park with friends when she was verbally abused and later attacked. She had her neck held back forcibly and was punched in the jaw. On the same date there was a further report where an injured party named the defendant as the one who had assaulted her. She had been kneed in the face and beaten around the head. When police approached Lewis in the park she was shouting loudly and told them to ‘f—k off’. A barrister representing the defendant said she was under no illusion as to the seriousness of the offences. He explained she had re-located to the Larne area and had engaged with the community addiction services. She had a difficulty with abusing illicit substances and alcohol.